You may remember the review I did a while ago of the Bosch DLR165K; if not, be sure to check it out. 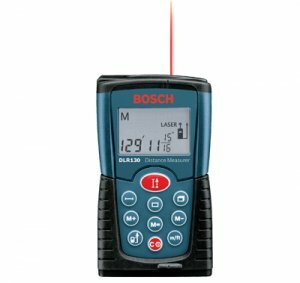 Bosch is coming out with a new version (DLR130K) thats looks to be tailored more to finish carpenters. I say this because this new version has something the old was lacking, the ability the measure in inches. The older version could measure in Feet-inches, decimal feet, and metric, while the new version adds Inches. The new version also loses a few features. The first you will notice is in the model number. It only measures to 130 feet, while the DLR165K measured to 165 feet. It also loses two measuring reference points, the pin for measuring in corners, and the center tripod point. I also assume it loses the Pythagorean theorem measuring mode. This brings up the question of price. The DLR165K sells for around $170 new, with Amazon selling it for $117. I would expect this new version to sell for less for the lack of features, but who knows.